The Nike Air Huarache was born back in ’91 as Nike’s first running shoe not to have a structural heel counter. And now, the Nike Air Huarache NM hits the track after receiving the same “Natural Motion” treatment that first made the Nike Free model such a lighter-than-air athletic shoe a few years back. The combination in technology sounds like something that may leave your Achilles heel vulnerable, but it’s light as clouds in a way that Hermes might rock. 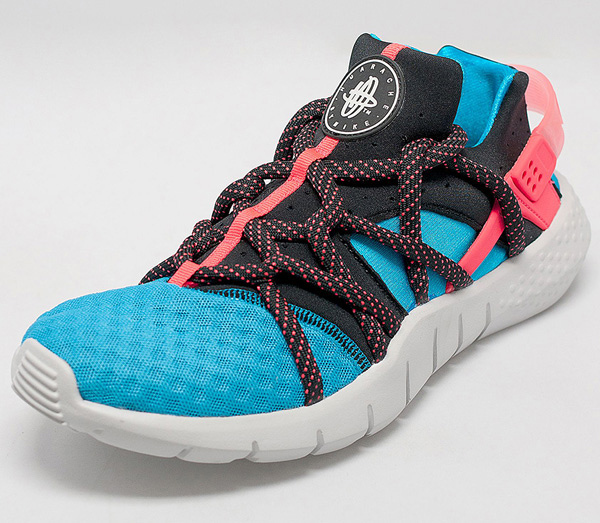 The upper is colored in “lagoon blue” with a breathable mesh toe, and the accents throughout — including Huarache-defining ankle strap — are detailed in crimson. Also has Ortholite sockliner and a gray IU outsole with deep flex grooves for extra flexibility. Get a pair for about $160. « Merry Christmas, Happy Holidays & A Blessings For a Fulfilling & Fruitful 2015!! !